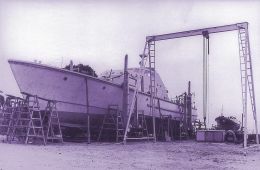 The adventure of the Tempest began in August 2002 with a preliminary that smacks of challenge: in Marseilles French skipper Georges Fillon had almost by chance discovered this splendid patrol vessel launched by Chantier de l'Esterel in 1963 and put up for sale by the Marine National because it had "reached its age limit". But like all such vessels it had been perfectly maintained right to the end. Having found and involved the right owner, all that was needed was a suitable boatyard to tidy up the boat's military past, honourable as it was, and turn it into one of the most fascinating superyachts afloat. This mélange of creativity, hi-tech, urgency, state of the art, passion and - why not? - risk could not but touch the heart of Marco Massabò. But we believe that what convinced the dynamic manager of WS boatyards, Savona, after the first contacts and a trial run in the Bay of St. Tropez, was the entry into his office of the Frenchman who, brandishing a 20x30 centimetre approximated watercolour of the boat, declared in a lapidary manner: ".et nous la voulons exactement comme ça!" "Oui," Massabò replied, and work began. WS is certainly not a small concern. Set up in 1998 by Massabò and Alessandro Novella it regularly takes in several Wally vessels for works, painting and wintering, while boats of the calibre of Whitefin, Taouey and Islander have been restored with top class workmanship. The workforce, almost thirty men, didn't take many days to completely empty the whole boat, engine room excepted, while the features of the unusual refit took shape. 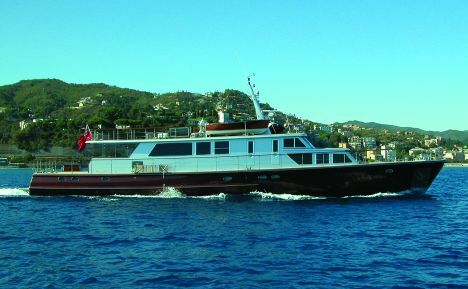 "I love blending the classic with the modern, the sacred with the profane," admits Marco Massabò, and a convergence with the owner's viewpoint led to this choice: a superstructure with lines in harmony with the hull, but completely hi-tech, not even considering constructions in wood, as romantic as they are heavy and complex. The saving in weight was not negligible: four tons less than the original deckhouse which was, moreover, in aluminium, as well as an obviously considerable gaining of space. A single epoxy sandwich mould for the roof and another for the walls. Another interesting problem arose for engineer Camporese's technical staff when it came to considering the finish of the hull. The original sheathing was a cold modelled lamellate consisting of three 1.5 centimetre layers of solid mahogany offset 45° from each other and fixed with an average of one hundred bolts per square metre on a mahogany keel and ribs. If on the one hand this satisfied the rigorous naval specifications, on the other it created a problem of an aesthetic order, impeding adequate smoothing of bottom and sides with view to final painting. Having excluded the use of filler, as banal as it was precarious because sooner or later the movement of a seam or the head of a bolt would have been revealed, the original and unheard of solution adopted involved the application on the entire hull, with masterful use of the vacuum technique, of a sheet of 4 mm. mahogany ply. Excess epoxy glue was expelled through special holes and the ply pressed at 50 bars onto the sheathing. The cohesion of the whole is optimal and the surfaces perfectly flat. The transom, to which a bathing platform has now been added, was faced in teak. The owner's choice for the paintwork, a contrast of pale silver grey for the superstructures and metallic "Chocolat" brown for the hull, didn't worry the WS chiefs in the least: for years the yard has been in the avant-garde in the field of metallic paints. Together with Massabò's hands-on work in his father's yard in Imperia, the staff's studies and experience have resulted in uniform and lasting paintwork in which each parameter, from the degree of metallic microsphere reflection to the final varnishes, can be perfectly controlled in the great kiln. The only part that has remained unchanged in the conversion from coastguard vessel to superyacht is the engine room. Of course the electrical and plumbing systems were redone and the following installed: 200l/h Technomar desalination plant, 2 Kohler 27 Kw generators, Frigobar conditioners, a centralised vacuum cleaning system, fire-fighting plant and everything else that facilitates life aboard during long cruises. But the engines were not replaced. 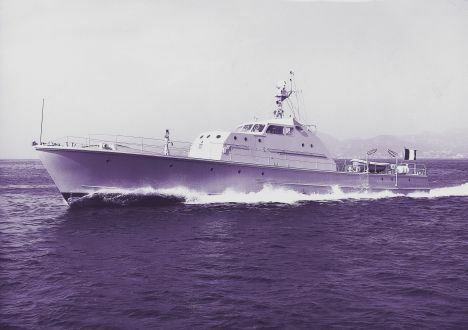 When André Mauric designed this class of patrol vessel in the 60's, weight/power ratios were certainly not those of a modern diesel. So with the power available within the prescribed weight limits, design of the hull and fineness of the lines played an important role in order to achieve the speeds requested by the customer. This explains why a thirty metre yacht can reach 22 knots, and maintain this speed even with a sea running, though powered only by two 800 HP engines. The semi-planing hull is finely V-shaped on entry, with a pronounced keel and the beam reduced to 5.80 metres, almost two metres less than a 100 footer of today. These two supercharged Baudoin 12 V date to 1989 and, given their limited number of working hours, were preserved together with inverters and shafting lines, all perfectly intact. The interior layout however created more than a few problems for the designer. The fairly narrow lines and the large engine room (the world's navies have never really given much priority to crew comfort) are the reasons why organisation of the various zones was rather complex and set on different levels. The saloon is on the main deck and its "minimal" furnishings exalt the spaces and the light from the large windows. As stylistic choice the owners went for tonal contrasts as interpreted by architect Marta Nicolini: light sycamore for walls and furniture, dark wenge for the floors, pale brown leather and a few unusual details like the extendable bridge table, faced in tungsten and crystal, in the dining area next to the living space. The galley is farther forward, well-aired by a skylight and fully equipped with Mièle electric household appliances that can satisfy the most demanding culinary requirements: it also has a separate exit to the deck. The natural continuation of the deckhouse houses the owner's suite, very bright thanks to side and front windows. A few steps lead down, beneath the forward deck, to a refined bathroom tiled with glass slabs. The bridge is on the half-deck above the owner's suite. Here the skipper, with the aid of the most modern instruments, handles the vessel both under way and during manoeuvres in port. An 18 Kw Sidepower has been installed at the bow for better handling in today's crowded marinas. There are three cabins in the guest area, each of course with private bathroom. 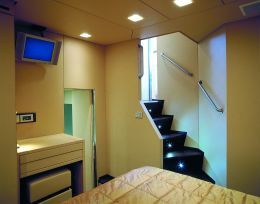 The access companionway is at the side of the wheelhouse and the layout is on different levels. Two of these cabins - the VIP and one of the twins - have been fully faced in leather, a solution as aesthetically valid as it is difficult to execute due to the amount of precision sewing required. But the company Inganni of Brescia, which created all the furnishings, has demonstrated that it excels in this field. In these bathrooms too the semi- transparency of the glass, the beauty of the ground-crystal surface, in which the washbasin is simply set by fusion, and the linear design of furnishings and fittings all contribute to a sensation of architectonic lightness, common to all the on-board design. Going back outside, the main deck houses a living area, with sofas and table in the shelter of the upper deck, while farther aft an unusual doghouse provides access to the crew's quarters: separate cabins for skipper and crew, bathrooms, laundry and mess. 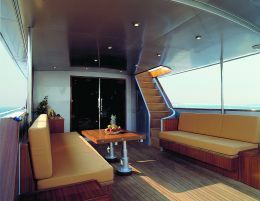 The Tempest's institutional solarium is on the upper deck, but there are no square miles of white cushions and printed coasters: here the small teak tables and the chaises-longues speak a more classic language. On-board equipment is completed by a dinghy in mahogany and two matching jet-skis. The patrol vessel's full name is actually The Tempest - WS, with clear Shakespearean references linked by a subtle fil rouge to both the owner's initials and those of the yard. After introduction into the fine world of yachting, culminating in the last classic motoryacht meeting in Imperia, the boat is now getting ready for a new season in the Mediterranean with, on the bridge, an indissoluble bond between the former patrol vessel and her mother country: Marc Maudet, another young French skipper.